NEW ORLEANS — Georgia’s Kendell Williams is used to breaking records and rewriting history. She can now add a record to her resumé for her most recent appearance on The Bowerman Award Watch List. The senior from Marietta, Georgia, found her name on The Bowerman Award Pre-NCAA Prelims Watch List, as announced by the U.S. Track & Field and Cross Country Coaches Association (USTFCCCA), on Wednesday for the 23rd time during her collegiate career. With this most recent selection, Williams surpassed Oregon’s Brianne Theisen for the most Watch List appearances by a woman in the history of the award. Last weekend, Williams competed in 3 events at the SEC Outdoor Track & Field Championships, finishing 2nd in the 100 hurdles (12.92), 5th in the high jump (1.80m/5-10¾) and 8th in the long jump (6.37m/20-10¾). While Williams was making history, a Hurricane was brewing in Miami. Shakima Wimbley made her debut on The Bowerman Award Watch List after winning the 200 and 400 meter races at the ACC Outdoor Track & Field Championships, in addition to helping Miami (Fla.) capture the 4×100 and 4×400 relay titles as well. Her 400-meter time of 50.40 is good for the top spot on the Descending Order List, and it also made the Fort Lauderdale, Florida, native the 8th-best performer in the event in collegiate outdoor history. During the indoor campaign, Wimbley captured the 400-meter NCAA title. Wimbley became the 1st Hurricane to grace the Watch List since T’Erea Brown made her 6th and final appearance on the Watch List dated May 4, 2011. The remainder of the list consists of the usual names that have graced the list all season long. Along with Williams, Oregon’s Ariana Washington and Raevyn Rogers, Ole Miss’ Raven Saunders and Georgia’s Keturah Orji continued their streak of consecutive Watch List honors. The quintet has now been on all 7 Watch Lists this year. Washington, Rogers and fellow The Bowerman Award Watch List honoree Deajah Stevens helped the Oregon Ducks capture the Pac-12 Championships this past weekend with stellar outings. Stevens ran the 2nd-fastest outdoor 200-meter race in collegiate history with a time of 22.09 while teaming up with Washington to help the Ducks win the 4×100 relay with a time of 42.81. Stevens also won the 100-meter title with a time of 11.05. Rogers won the 800-meter title with a time of 2:02.93 while guiding the 4×400 relay team to a 2nd-place finish. Orji won the SEC Outdoor Track & Field Championship in the triple jump with a mark of 13.95m (45-9¼). Saunders, however, did not compete during the conference championships. Arizona State’s Maggie Ewen was named to her 3rd-straight Watch List after sweeping the throws events at the Pac-12 Championships. The product from St. Francis, Minnesota, won titles in the shot put (17.18m/56-4½), the discus throw (59.81m/196-3) and the hammer throw (70.20m/230-4). Alabama’s Quanesha Burks and LSU’s Aleia Hobbs also found themselves back on the Watch List once again. Burks won the long jump at the SEC Championships with a mark of 6.82m (22-4½) in addition to placing 8th in both the 100 meters (11.33) and the 4×100 relay (44.41). Hobbs bested Burks in two of the aforementioned events, as the native of New Orleans won the 100 meter event title after running a blistering 11.12 while also helping the Tigers place 1st in the 4×100 relay with a time of 42.12. Falling off the Watch List, but still receiving votes, was Kentucky’s Sha’Keela Saunders, who had been on the last 4 Watch Lists. Also receiving votes was Baylor’s Annie Rhodes. 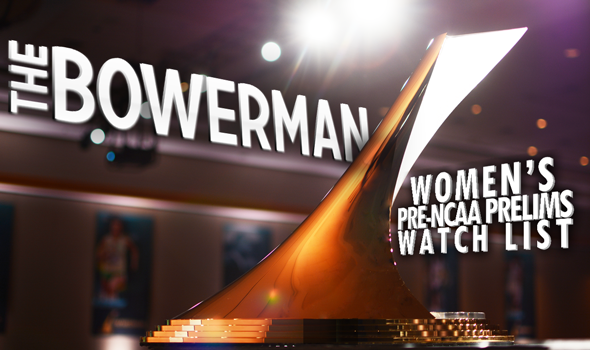 The next Women’s Watch List for The Bowerman Award will be released on June 5, in conjunction with TrackTown Live.